Gwangalli Beach or Gwangan Beach is one of the popular beaches in Busan. 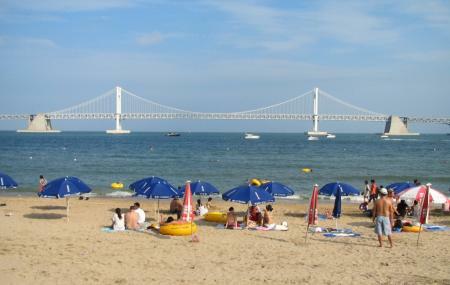 Located at Gwangan-dong, Suyeong-gu, the beach looks like a half carved moon with Gwangan bridge crossing over it. It is the fine sand of the beach that makes this place special among the tourists. At night the beach looks more beautiful with the bridge illuminated. At day time, you can enjoy fishing in the clean water of sea and prepare it on the spot itself. For adventurous tourists, you can rent a yacht from Olympic Yacht Rental. Water activities like jet skiing, Water-skiing, wakeboarding, windsurfing and banana boating can be enjoyed. The beach has an outer concert stage where popular event, Busan Ocean festival and many other events are being held. For entertainment, museum, theatres, a cultural center and an art gallery are there. For foodies, lots of restaurants, coffee shops and nightclubs are there in alley where you can dine with your friends and families. It’s a great place to spend half a day for people of 20s and 30s. Also, visit the popular attractions in the city by following Busan itinerary 1 day. Facilities available- Shower booth, changing room, water-supply area, rest room, free parking space area. Best time to visit – late June to late August. To get the best view of the beach from Diamond Bridge, visit the beach at night. The centre providing equipments for water activities remain closed on Mondays. Rent yacht from Olympic Yacht Rental. Promotional packages of five items – 75,000 won (you can enjoy these for a whole day). Rental price becomes 25,000 won - for more than 20 people group; for students. How popular is Gwangalli Beach? People normally club together Taejongdae Park and Yongdusan Park while planning their visit to Gwangalli Beach. People also prefer to end their day with Gwangalli Beach. Beautiful beach with many activities and events, restaurants and fresh fish markets. There is an awesome view of the newly named Diamond bridge. Had an awesome night time stroll along this beach with my husband. A perfect night with great views of the bridge in all its glory! This place has one advantage over Haeunde. Fireworks are not prohibited. And I like that. Also at night you can have beautiful view on bridge and take good pictures. beautiful place, lots of good coffee shops and restaurants with a fantastic view of Diamond bridge.